To train over 1000 drivers per year in the coming years, the SNCF will place greater importance on training on simulators. From now until 2019, CORYS will deliver 36 simulators with a cabin, simulation on demand, eye-tracking, the latest engine vehicles equipped with ERTMS, and more. With this project, the SNCF buys the best in terms of simulation for training. This is what was asked in the international invitation to tender issued in 2016 and CORYS won against three competitors. “We have never installed as many innovations for such renewed and specific training objectives” says Denis Milhet, CORYS Account Manager. The biggest challenge: attract enough candidates to train more than 1000 drivers each year, on a twelve-month course. The new simulators, with innovative functions as well as appearance, will help attract candidates. An industrial designer is involved in the project and has taken into account the SNCF’s particular red. “The trainees, instructors and the entire company need to be proud of their tools” explains Denis Milhet. If simulation is strengthening it is also to be used to overcome the increasing lack of availability of the rolling stock. Training on a real machine is difficult. To compensate, instructors will have new tools at their disposal, such as eye-tracking to closely follow the trainee’s gaze. Furthermore, compromises have been made on what can be taught on the simulator and what can be worked on in real life situations. The goal: a final exam success rate as high as possible. 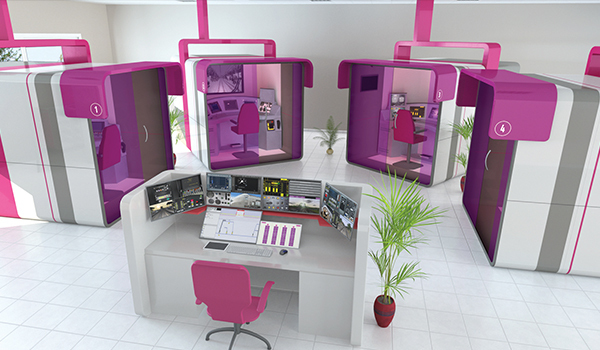 CORYS will deliver 36 cabins in groups of four which will be installed in nine different training campuses in France. Thanks to removable plates, they will enable training on three different trains: the Regiolis, the BB27900 locomotive, and the high-speed 2N2 train, which are currently being modeled. The trainees will practice on over 3 000 km of line which has been created in the latest generation of Matrix 3D pictures: 2 000 km of high-speed lines, 600 km of generic lines and 300 km of Parisian suburb lines. Moreover, Simulation On DemAnde (SODA) which runs on a tablet will be offered to trainees for more autonomous training or in class via a Wi-Fi connection. SNCF ambitions also rely on the instructors. The technical platform set up by the training department will suggest different scenarios and formats of training session which will harmonise teaching on the different campuses. During the simulation sessions, they will be able to freely move around the classroom to give instructions or to follow the progress of a trainee thanks to Tactis, which will show them their supervision interface. At CORYS, 20 engineers are working full-time on this exceptional project.